Wide Eye Creative has a great portfolio layout on their site because it is organized and there is clearly a lot of work to see which makes them look experienced. They also have a hover option which is helpful on a site where there is so much to see. Nuts and Woods is similarly designed, but it is a little more spaced out, providing a sense of simplicity, which matches the style of the products they design. This site also has a hover over images which gives the page a splash of color. The about page on Marcel Duende‘s website is simple and well spaced out, even if the type is a bit small. The dark page with the light text is appealing and grabs my attention. Make Me Pulse makes it fun to navigate to the about page. But what really makes the about page great is that it doesn’t just present you with a paragraph, but slides a few sentences across the screen that communicate the mission statement of the company. Stuart Mayhew‘s resumé is attractively designed thanks to its simple and clean color palette and unexpected graphics. The organization of the information make the document fun to read. Bernice Beltran‘s resumé also has a simple color palette and attractive graphics that communicate a message. This document is fun to read, and I get through it very quickly. Staras Technical Production contact page isn’t set up as a typical form, which is what I think makes it so appealing. It also informs you who exactly you are contacting, which makes the connection seem more personal. After navigating to the Allamar Design contact page, there is a video behind the form, which is what makes this page unique. The form is also set up in an organized and simplistic way. Studio Airport is a design firm based in the Netherlands. They design everything from identities, to posters, to videos, to websites, objects, campaigns, and more. Their logo is three arrows. There are more arrows and sharp lines in other icons in their website. This creates the same sense of style throughout the site which communicates the consistency of style within the brand. Tawn is a designer whose logo on her site is typographical. Tawn has a focus in fashion and the names of her collections match that of her typographic logo. Both use the same sans-serif font, and both are mainly typographic.This creates a constancy in the brand and ties her collections back to her logo. 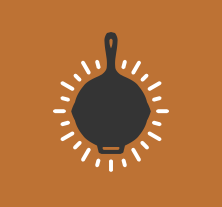 Cast Iron Design is a design form that adopted the logo of a cast iron pan. This logo is effective because it implies that the services they provide are solid and dependable, just like cast iron. The logo also has white lines surrounding it facing outwards, almost like an idea lightbulb lighting up. This implies a sense of creativity. Out of all the designers listed here I would probably employ the services of Cast Iron Designs because I believe their brand is best represented through their logo.